Assault Industries’ Ballistic D universal steering wheel is a D-shaped, leather-covered wheel with an aluminum frame and a billet-aluminum center plate. The stitching on the leather cover is available in six colors to match most popular UTVs. To provide more room for the driver, the Assault wheel is smaller in diameter than the stock wheel on the RZR 900 we tested with, and it has a flat lower edge. The Ballistic D universal wheel is $160, and it requires Assault’s $70 hub adapter. It’s a nicely made black-anodized billet-aluminum piece. 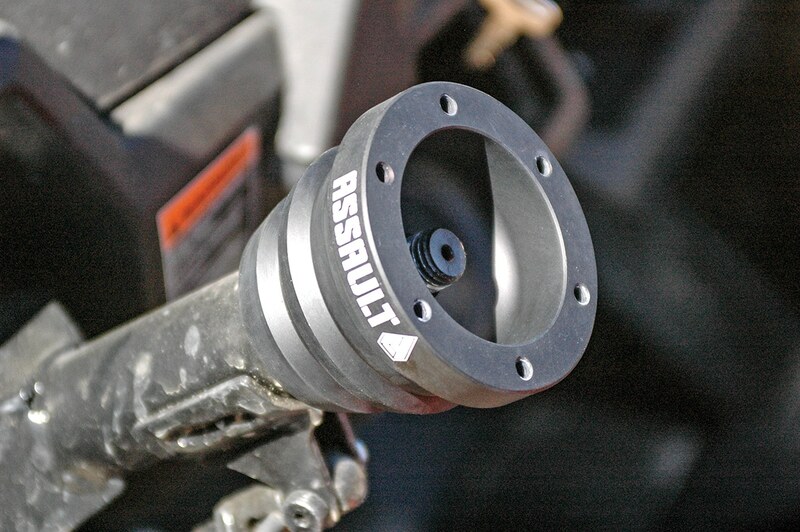 To mount the wheel to the RZR, you’ll need Assault’s hub adapter. On the RZR, the steering wheel nut is under a trim cover. You can pry the cover off with a thin-blade flat screwdriver. Remove the nut. If the wheel won’t pull from the splined steering shaft, strike the shaft with a hammer while pulling up on the wheel and it should come off. Install the hub adapter on the steering shaft so the mount holes on the adapter and wheel line up with the steering wheel centered and the vehicle’s wheels are straight. Install the steering shaft nut. Put non-permanent thread-locking compound on the steering wheel mounting screws, line the center plate with the mounting holes and install the mounting screws. The Allen wrench Assault supplied with the wheel didn’t fit the fasteners as well as the better tools we had, so use high-quality tools to avoid damaging the screws. Assault’s D-shaped wheel feels far more comfortable and grippy than the stock plastic wheel in bare hands or with gloves. The slightly padded leather wheel has thumb pads to protect your thumbs in rough terrain, and the strong aluminum frame has nearly no flex, unlike the stock wheel. The wheel’s D-shape and smaller diameter than stock make the cab seem more roomy while driving, and it opens up more room to make getting in and out of the vehicle easier. Some performance parts only help in certain conditions. 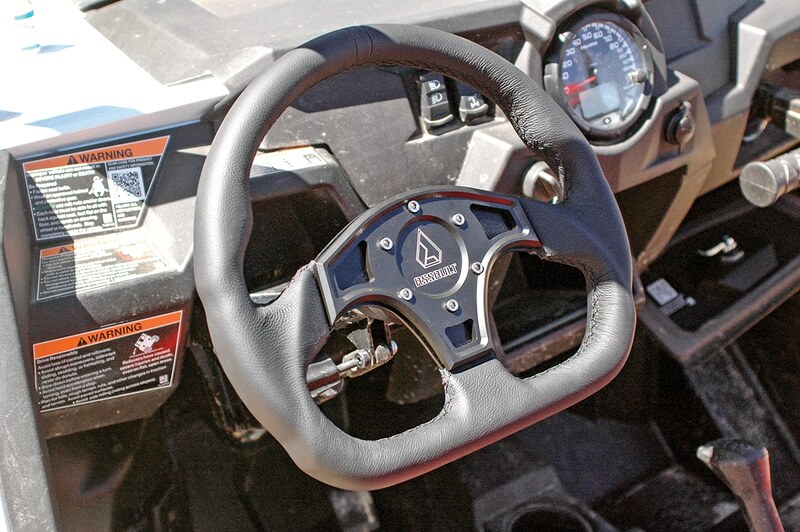 Assault’s Ballistic D steering wheel made every mile we drove with it better, and it makes getting in and out of the RZR we tested it with easier. The supplied Allen wrench should fit the fasteners better, though.